Home Retro Planet Archives American Icons Farewell, Annette! It’s a sad week for retro news (and we really, really don’t want to turn this blog into a massive obit site), but we can’t help but bid a fond farewell to 1950s icon Annette Funicello. Plenty grew up watching her on Mickey Mouse Club, and in later years as she blossomed into a legendary actress. Born in Utica, New York on October 22, 1942, Annette was discovered by Walt Disney in 1955 when she performed as the Swan Queen in Swan Lake in Burbank, California. She was the last to be selected as a Mouseketeer (one of the few to be chosen by Disney himself). She gained immediate popularity – reportedly garnering some 6,000 letters a month by the end of the first season of Mickey Mouse Club. She went on to appear in several Mouseketeer sketches and dance routines, including Walt Disney Presents: Annette, which also launched her singing career. Rather hesitantly, Annette recorded several records, and many became pop hits during the ’50s and ’60s, including “O Dio Mio”, “Train of Love” and “Pineapple Princess”. In 1959 she recorded “It’s Really Love”, which was a rework of Paul Anka’s song, “Toot Sweet”. It was reworked again in 1962 as “Johnny’s Theme” for The Tonight Show. 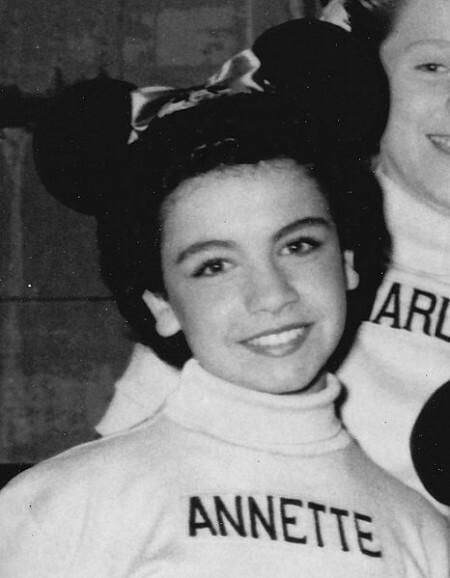 Post-Disney days, Annette was best-known as a “beach party” movie icon. She starred in a series of films with Frankie Avalon. Her wholesome image was referenced in the Grease song “Look at Me, I’m Sandra Dee”. In 1979, Annette started appearing in Skippy peanut butter commercials. In 1992, Annette announced she had multiple sclerosis, a condition from which she’d been suffering for many years. This is the same year she was inducted as a Disney Legend. Her autobiography, A Dream Is a Wish Your Heart Makes: My Story, was released in 1994. It was later made into a TV-movie. She also produced a line of teddy bears and a fragrance called Cello, by Annette. In 2012, Canada’s CTV Television Network profiled Annette. She’d been out of the public eye for nearly 15 years, and viewers saw that she was unable to walk and speak, requiring 24/7 care. Annette died on April 8, 2013.